McDonald's is an iconic American fast-food restaurant, and the Golden Arches logo is recognizable throughout most of the world. 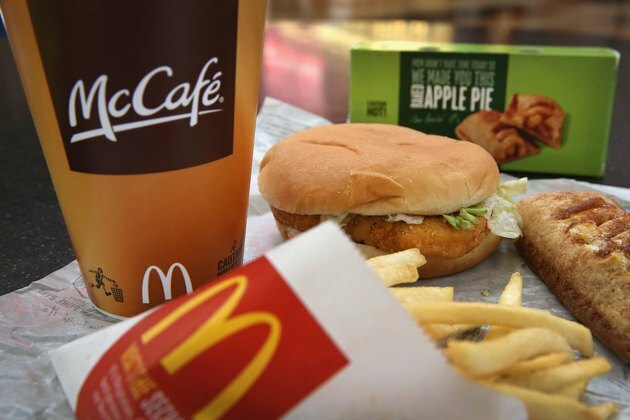 In the U.S., the McChicken sandwich is popular with diners on a budget, since it is part of the Dollar Menu. A McChicken sandwich includes a white bun, shredded iceberg lettuce and mayonnaise. The deep-fried, breaded white-meat chicken patty has black pepper and other flavorings to enhance its taste. A standard McChicken sandwich without cheese contains 360 calories. This sandwich has 150 calories from fat. This trans fat–free sandwich contains 3 g saturated fat, with 16 g total fat. A McChicken sandwich also contains 14 g protein and 830 mg sodium. Many experts recommend that healthy adults not exceed 1,500 mg to 2,300 mg of sodium a day. In San Diego, a McDonald's restaurant has created new, spicy versions of the McChicken for the local market. The Jalapeño Cheddar McChicken and the Cheddar Onion McChicken both use white cheddar cheese. To round out the meal, choose a side salad instead of fries. A side salad with Newman's Own Low Fat Balsamic Vinaigrette has only 60 calories and 3 g of fat, instead of the 230 calories and 11 g of fat in a small order of fries.